The Chancellor of the University of Nebraska Omaha, John Christensen, is retiring. At a press conference Monday morning, Chancellor Christensen announced his last day in the position will be June 30th, 2017; almost 10 years and 10 months since he took the position. During his tenure, Christensen oversaw the transformation of UNO into one of the top urban metro campuses in the Nation. Among other accomplishments in the last 10 years, UNO moved from Division II to Division I in athletics, became classified as a doctoral-research university by the Carnegie Foundation, and celebrated back-to-back records for the largest and most diverse incoming classes in UNO History. Christensen said none of the accomplishment over the last 10 years would have been possible had it not been for faculty and staff working together. 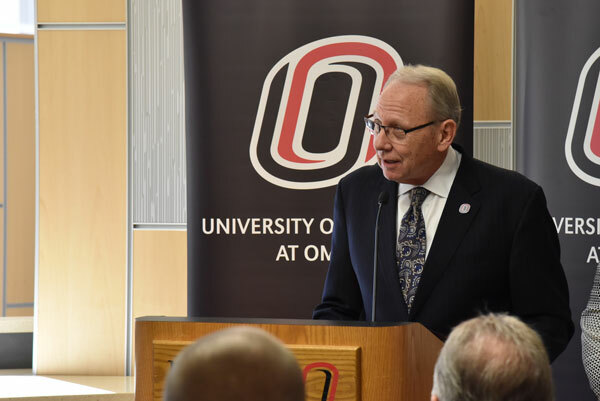 Chancellor Christensen said while he is stepping down, he will not be leaving the UNO Maverick family. Instead, he will transition into a new position where he will work the University President Hank Bounds on special projects affecting the UNO campus.